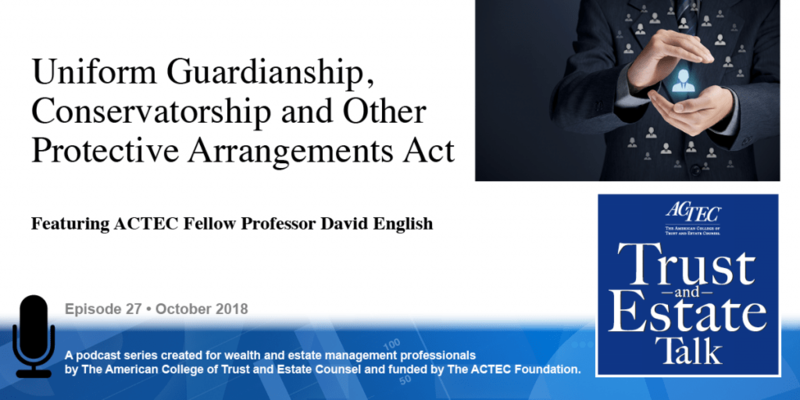 “The Uniform Guardianship, Conservatorship, and Other Protective Arrangements Act.” That is the subject of today’s ACTEC Trust and Estate Talk. This is Joe Hodges, ACTEC Fellow from Denver, Colorado. In 2017, the Uniform Law Commission adopted the Uniform Guardianship, Conservatorship, and Other Protective Arrangements Act. To learn more about this act, you will be hearing today from ACTEC Fellow Professor David English of Columbia, Missouri. Thank you, Joe. I was the Chair of the Drafting Committee for this uniform act, and I’m summarizing for you today two presentations that I gave at the ACTEC Summer Meeting about the Act. One to the Elder Law Committee and a second to the Committee on State Laws. The Act is almost 150 pages, double-spaced, and so in the space of 8 minutes or so, I cannot possibly describe all of its provisions. So what I’m going to do today is to hit the highlights, particularly the highlights that relate to what is called the Third Guardianship Summit, which was held in 2011. The recommendations of which form the foundational principles of many of the provisions in the Act. Uniform law process is a long, long process– the drafting committee was formed in 2014; I was named as Chair, Nina Kohn of Syracuse University had the heavy laboring work because she was the reporter. And we were assisted by numerous advisory groups, as many as we could find, with an interest in guardianship, including an advisor from ACTEC. Our advisor was Deb Tedford, a member of the Elder Law Committee and many of the other committees within ACTEC. And the various drafts were discussed over the course of the drafting process, both by the Committee on State Laws as well as the Elder Law Committee. The Act was approved, at least in draft form, so the way that uniform acts are done is that when they’re approved by the commission as a whole, it’s really a tentative draft that was done by approval last July. We then go through a style committee process which lasts three months. And then we write the comments, and I’m pleased to report that our target date for completing the comments for the Act is in fact next week (podcast recorded June 22, 2018), and so within the space of two weeks or so, the final draft with all comments will be posted on the Uniform Law Commission website www.uniformlaws.org. Uniform laws are not a new topic for ACTEC Fellows. Many of you practice in states that have enacted the Uniform Probate Code or the Uniform Trust Code, and the Uniform Guardianship Acts are similar: that is they’re intended to be models for the states to enact. It is not uncommon – in fact it’s typical – that states need to adapt the uniform law to meet their specific circumstances, so we really don’t expect that this new uniform act will be enacted with a change; we expect that it will be used for ideas and that states will need to modify it to meet their particular circumstances. This is also not the first uniform act on guardianship – in fact it’s the fourth. Uniform Probate Code approved back in 1969 contained an article on guardianship. That was then updated in 1982 and could still be enacted as part of the Uniform Probate Code but also was given a new name: Uniform Guardianship and Protective Proceedings Act. That was extensively revised in 1997, and now we have another revision some 20 years later, and that’s fairly typical of uniform acts; circumstances change, and there’s a need periodically to overhaul the statutes. So many of you live in states – close to half of you live in states – that have a prior version of this uniform act that I’m speaking about this afternoon or at least whenever you’re hearing this podcast. And others of you, in fact all of you, live in states that at least have drawn ideas and have cherry-picked from prior uniform or versions of this uniform act. Let me explain the Act’s title and then I’ll explain the organization and then a few themes in the Act. Guardianship in the majority of states is court the appointment of a person to make personal-type decisions for the individual. In a majority of states, a conservator is appointed by the court to make property-related decisions – and your state of course may have a variation on that terminology. It doesn’t mean you can’t enact this statute, but you very well may substitute terms when you do so. But this act, which has a very long title – not only do we have guardianship and conservatorship in the title, we also have a reference to protective arrangements. And so a major theme of this act is to encourage use of alternatives to guardianship and conservatorship. Not only the alternatives that you draft as part of the estate-planning process like powers of attorney, but ones that you couldn’t plan in advance for various reasons, and now you’ve got a crisis: you need to sell property, or you need to sign an admissions contract for a long-term care facility, but you don’t necessarily need a permanent appointment of a guardian or conservator. And so Article 5 of this act deals with that topic: an alternative to guardianship and conservatorship called the Protective Arrangement if there’s a specific transaction that you need to have done but you don’t need a full-blown appointment. The Act, of course, deals with many other things: in addition to adults; it of course also deals with the guardianship of minors of which I’m not going to talk about in this podcast. Much guardianship reform in this country is based on various conferences that have been held over the years. And in this act, much of the core principals are based on the Third National Guardianship Summit that was held in 2011. And so let me mention some of the principles of that summit and very briefly how they are incorporated into this new uniform act. Number one is terminology, the Act gets away from terms like “ward,” “incapacitated person,” “disabled person,” and so on. That is, it doesn’t put a label on the person for whom the guardian or conservator was appointed. There’s very much an emphasis today in groups that work with people with disabilities on what’s called “person-first language,” and that’s what the Act adopts. If an individual is under a guardianship, that’s what they’re called in the Act. If an individual is under a conservatorship they’re called an individual under conservatorship. Secondly, the Act makes a major effort to make the duties of the guardian and the conservator more transparent. This also is a recommendation of the Third Guardianship Summit. And for those in ACTEC, we tend to deal with property issues, and so we have a great interest in the Uniform Prudent Investor Act, in particular, and also the Uniform Trust Code, and this act incorporates key duties from those two other acts into the responsibilities of a conservator. And also spells out in more detail the duties and responsibilities of a guardian. A final thing that I’ll mention, which will be the third big and final thing of this podcast, are the decision-making standards for a guardian or conservator. Traditionally, that was a best-interest standard, which was in theory an objective standard. We’ve had a movement due to cases like Quinlan and Cruzan in the healthcare field towards much more of a substituted judgement approach. And so when you read the Act you’ll see really a balancing between substituted judgement and best interests. So where possible the guardian or conservator is to make the decision that the individual under guardianship or conservatorship would have made, but that can’t be without limits such as: do you have the assets in order to carry out what those wishes would have been? The other thing that the Act does is it spells out the responsibilities, particularly in the guardianship area in more detail and so the substituted judgement concept is applied to healthcare decision-making in the Act, the financial decision making in the Act, and also the residential decision-making, among other things. And so this is – even though it may seem like a long podcast – this is a very brief introduction to this important uniform act. I certainly encourage ACTEC Fellows to look at it and I thank everyone who has listened to this podcast for their attention. Thank you very much. Thank you, David, for teaching us about this new, important Uniform Act.